Weekly Recap #247: Tai Ming Part 2 on Frontline!! Finally, the second zone’s on Frontline! It only took about 4 months guys!! ;) However, if my (Vilya’s) playthrough of the area is any indication (1 hour 20 minutes), it’s a decent amount of playtime for that amount of work, at least compared to our previous areas. Anyway! We’d love to hear how long it takes you to play the area, if you got stuck anywhere, what you liked/disliked and, of course, any bugs you found! Please spam away, we’d love to hear everything (and feel free to link us any cool Let’s Plays of the area, as seeing how people think and try to interact is extra important in this area). This first part is all about the actual area your character will be able to move around in. 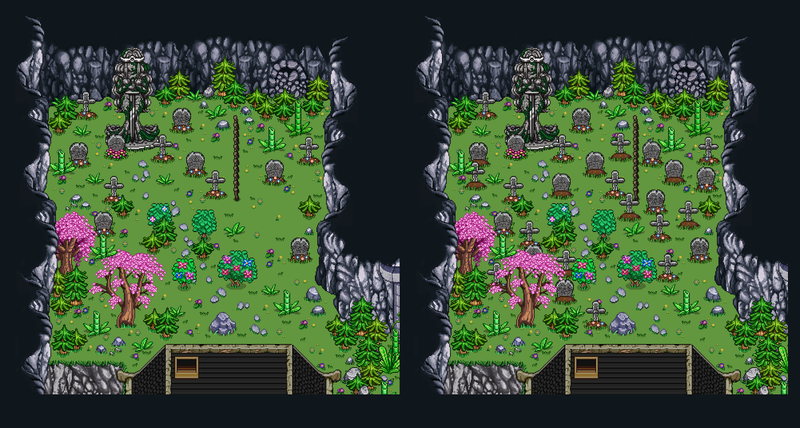 It consists of the same type of environmental decorations as the Mount Bloom outskirts, with the addition of some rocks and details from Evergrind Fields and Tai Ming. There’s a strange puzzle in the upper parts of this map (which isn’t completely shown in this picture), and one part to the puzzle is that you cannot move things around in the present. As such, I made a version of the puzzle block that wasn’t able to withstand the test of time, and has crumbled too much for you to be able to push it around (video game logic)! Seeing as the alcoholic beverage hidden in this room was turned into an ale rather than a wine, the color was changed to better suit the drink in question! 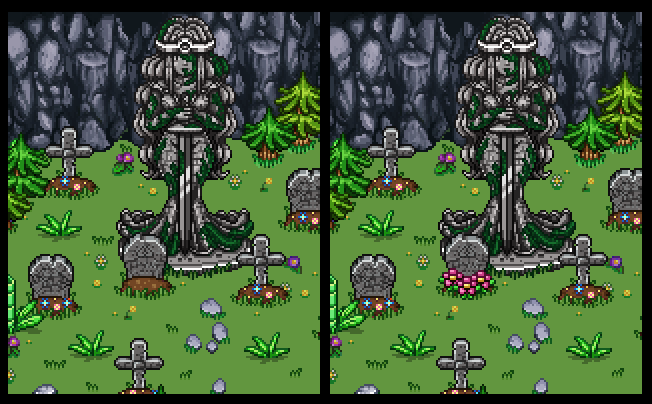 Due to some grim times up ahead in Tai Ming, we decided it was time to increase the number of tombstones in the cemetery greatly, too… Whatever could be happening? The answer awaits you in the third zone! While being based on Lea visually, this character is quite different from her CrossCode counterpart. In fact, she’s a cyborg built built by the Flying Fortress crew with multiple personality and vocabulary settings. How advanced! She’ll be hanging out with the other Flying Fortress guys in zone02, demonstrating the newly invented Phase Shift techniques. This week, we’ll likely take care of any bugs that appear through the frontline testing, as well as add another bunch of polish. I’ll also continue working on the third zone of Tai Ming, which will conclude your adventures in this mountain. How exciting! We’re finally getting closer to getting the second zone up and running in Frontline! As such, we’ve all been very busy adding the final touches to the zone and bug testing the heck out of it all. 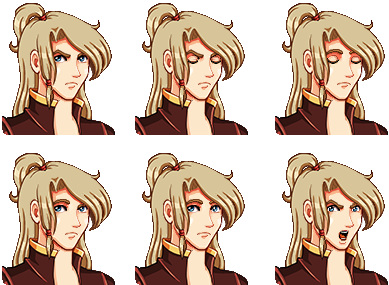 We have some exciting preview GIFs to show you, but first, some more expressions! 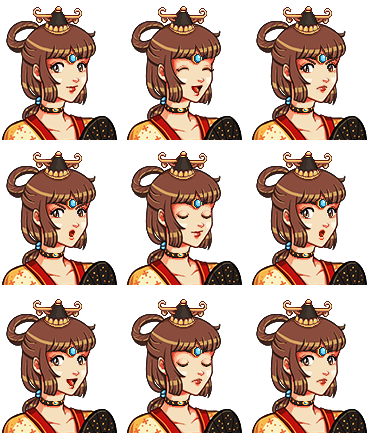 The fourth and final (for now) batch of expressions features an accessory saleswoman, Faita from zone one, who you could say has fallen on hard times – at least if you go by her expressions, a male priest, the greedy owner of Puzzle World, the visitors from Flying Fortress and the gardener from zone one, who is still tending to the gardens, only this time in zone two! So, these last few days we got to do something awesome: we actually play tested Tai Ming’s second zone!! It’s true, after many months of working on this place, Teddy put enough together that it was possible for us to run through the entire thing! For me (Vilya) the zone took 1 hour and 20 minutes to complete, but then I tried to talk with most people (gotta double check that dialogue) and had a slightly underleveled character. On the other hand, I knew exactly where to go and what to do, seeing as I’ve been part of designing everything. It’ll be interesting to hear how long it’ll take for you guys! 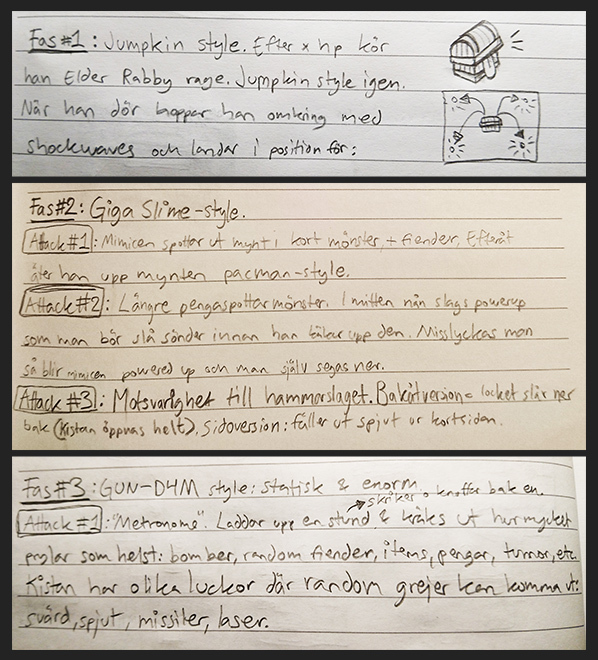 After running through the entire thing each of us took notes on things we liked and things we wanted to change, as well as any bugs we found. 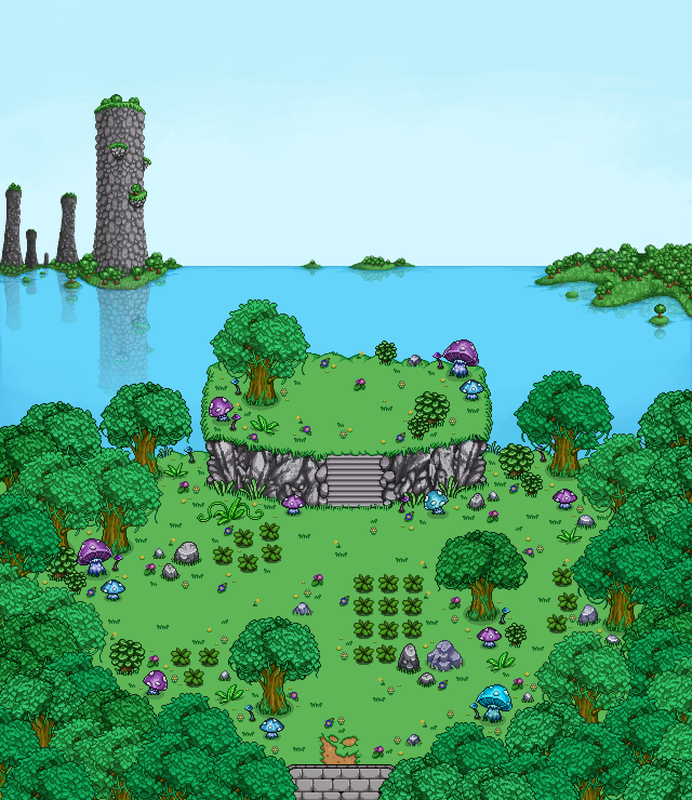 Luckily, we were mostly in agreement that very little needs to change – in truth we rather feel like Evergrind City needs to change, since this town is much more vibrant and alive compared to the capital… I guess we managed to overdo things as usual. Among the things we’ve yet to add, there’s 2-3 flashback orbs, with cutscenes that haven’t been made yet. In these orbs more of Zhamlas story will be revealed. Who is this strange child/young man anyway, and how come he’s so important to the story?! See you next week – hopefully with a new patch uploaded! Hey guys!! It’s been another week, and it’s me, Vilya, back to bring you another recap of what’s been going on in the Pixel Ferrets office! There’s still two things I need to make for this room. First we need standing, decayed version of the statues for present times, as the statues won’t fall if they’re standing next to a statue that would block the direction it would have fallen in. This is mostly to make it easier for us – instead of having to figure out how to stack the statues on top of one another, they just won’t break as severely if it means they would have fallen on top of another statue. I also need to make a broken version of the glass box in the lower left corner, so it’s possible to let out the statu– whatever’s in there. But, that’s for another day! 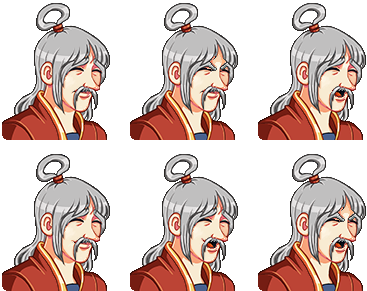 Next up, as Teddy has been working on the cutscenes in Tai Ming’s second zone I decided to go over the dialogue and start making a bunch of expressions so that can be properly finished! She’s both happy to see you, and has some serious worries on her mind. Wonder what those are about.. Since his adoptive father’s speech about being strong, Zhamlas life has taken quite a serious turn, and unfortunately there’s not a lot of room for positive emotions in his life nowadays. The ancient Quest Master, Quinton’s ancestor(? ), has a few more expressions than his present day counterpart. He has added both surprise and happiness to his range of emotions! Finally, some Caveling animations from Fred! What are they up to in Tai Ming?! Another week, and more Puzzle World! For this room, I kind of wanted to add a mascot of some sort. A lot of theme parks use mascots here and there for decoration, and I thought this place shouldn’t be no different. And what better shape than a puzzle piece? 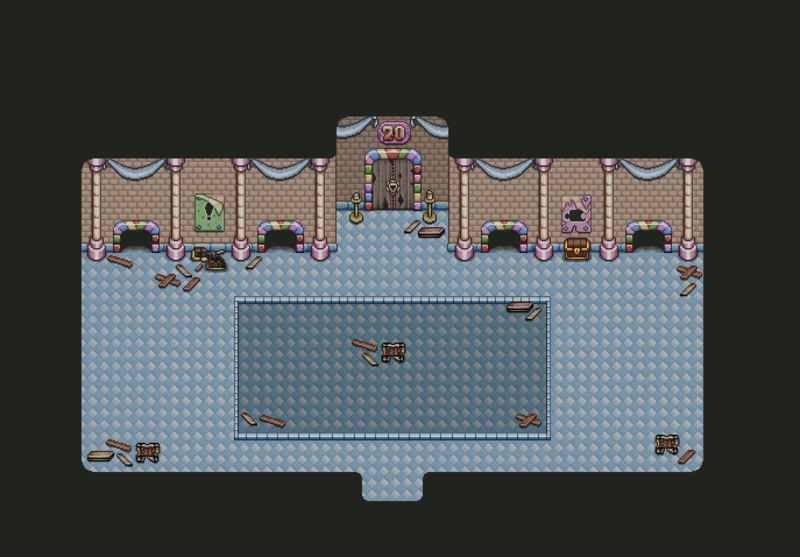 Perhaps I should add some more, maybe of different shapes and colors, to other rooms! The floor is kind of bare in this room, as it’s a fighting room and we don’t want you to run into a bunch of colliders as you battle (cause that’s super annoying). 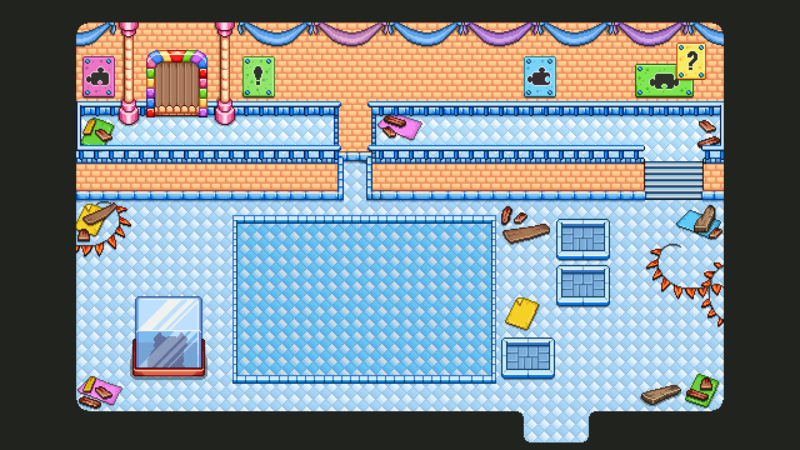 I did add some boxes to the corners though, since I didn’t want the room to look completely empty. Since this place was never really finished, I think it makes sense that boxes with supplies for the continued development of the theme park still remain here and there. 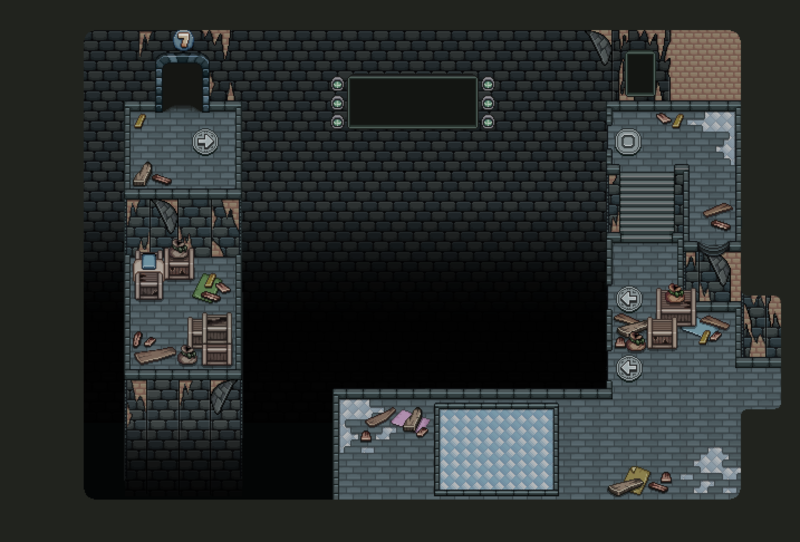 Next room is the monkey challenge room, which has been previewed in a previous post. 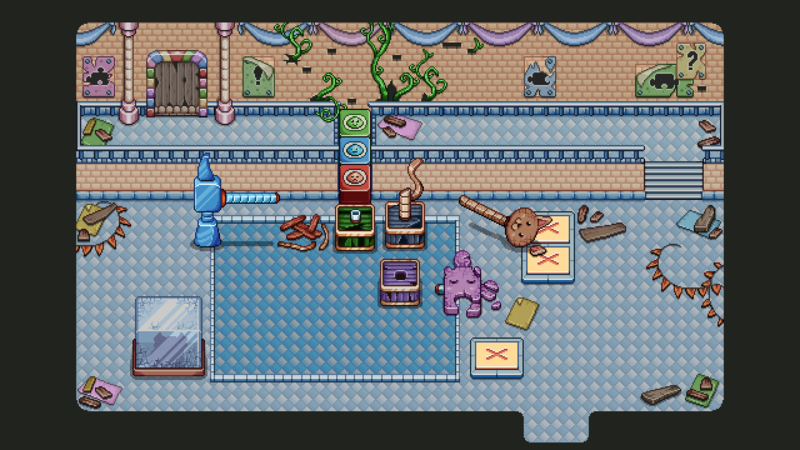 Here, the player will try to steal back a key from a gang of annoying monkeys, intent on keeping the key to themselves! 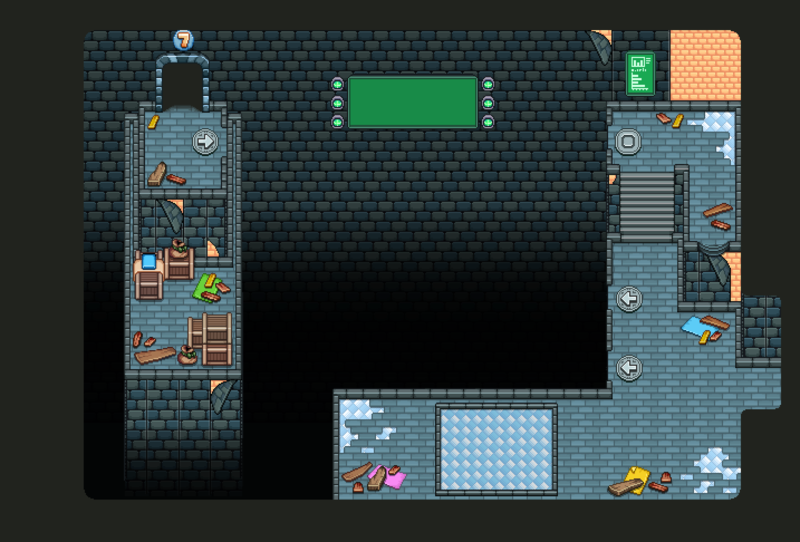 As with the fighting room, the key to this room is to keep the floor as clean (from colliders) as possible, since you’ll spend your time in here trying to beat up and chasing enemies back and forth. 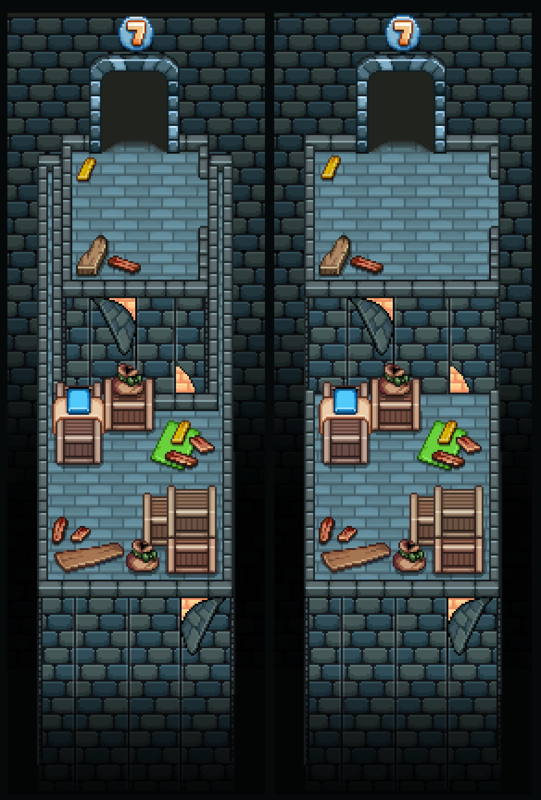 Since we had a prototype for this room already, I kept the same size as in the test. It worked well enough when we tried it, so no point changing a size that already works! I also had to make that big glass thingy, containing something you need to figure out how to get out of there! And it was a lot of fun: shiny things are the best to make! Now, as the third zone of Tai Ming – and the final challenge(s) of the dungeon – draws near, we decided it was time to have a meeting to flesh out the final boss of the dungeon: an ancient Mimic! 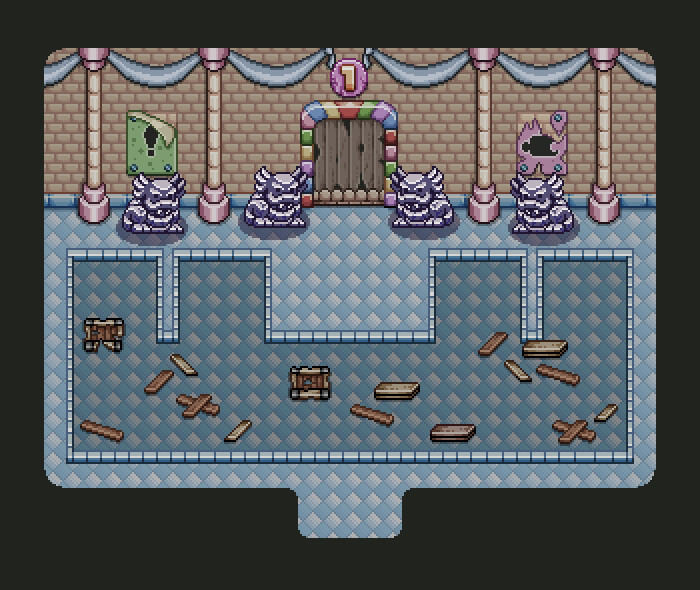 Pretty much since we started developing Grindea, we’ve known we wanted a boss mimic somewhere in the world, and once we knew the third “temple” would be an ancient town where time travel is the focus, we couldn’t think of a better place for our Mimic! During the first phase, the mimic is little more than a jumpkin – but in the shape of a chest. It will have one or two special attacks, but this is definitely the easiest stage, and should be over pretty quickly. In the second phase, the mimic has grown to the size of Giga Slime (roughly). The battle will remind you of that boss as well, as the mimic jumps around the battlefield, doing damage with its massive body. It also has a series of special attacks where it spits a ton of coins on the ground in different patterns – which may hurt you as they land – and goes to eat them up straight away, dealing damage to anyone in its path. Sometimes, it will spit out a powerup of some sort as well – and if you fail to destroy it before the Mimic eats it up again, it will gain a powerboost against you. 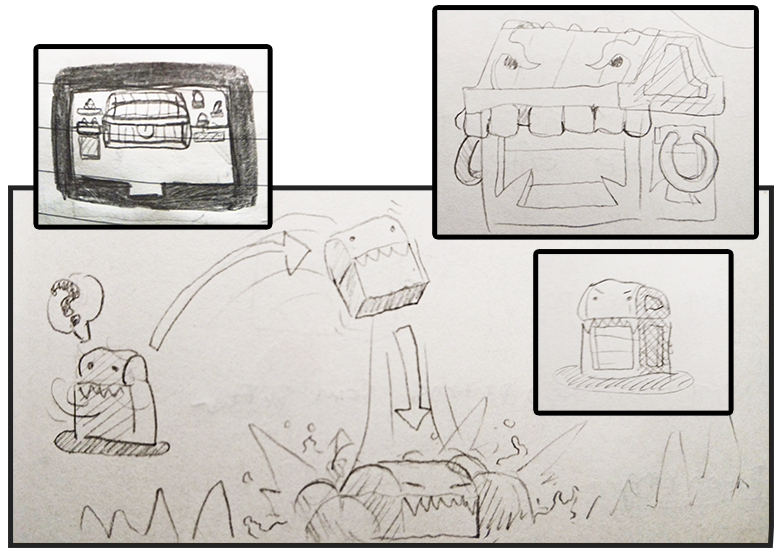 Like Giga Slime, the Mimic will also have an attack resembling the hammer-attack of Giga Slime; basically a regular attack it can pull if you stand too close to it for too long. 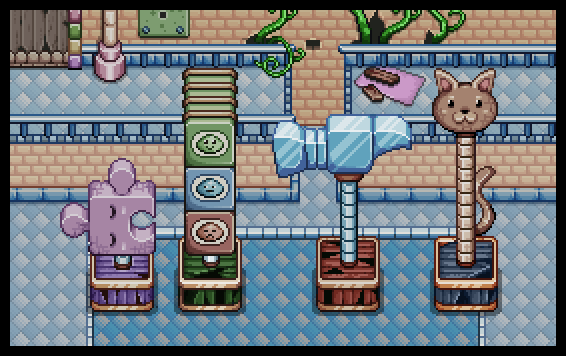 Only instead of producing a slime hammer, it will use any of the weapons inside of it (or its tongue)! In the third phase, the boss has grown to a massive size, and is now static. It will attack you using any of its many hatches to send out weapons of various kinds against you. It also has a special attack where it blows you to the opposite end of the screen and sends out a ton of things from its inside! These things might be enemies (from anywhere in the game), barrels, crates, items, money – basically anything you can think of. This is one ancient mimic, and it’s been stuffed with things over the years! Since the boss is divided into three different phases, we haven’t given each phase too many attacks. As we start prototyping this battle, it’s possible we’ll add more, but I think this is one of those bosses where the battle might be challenging enough even without 500x different attack patterns! I guess we’ll see – either case I’m very excited to see this in the game. 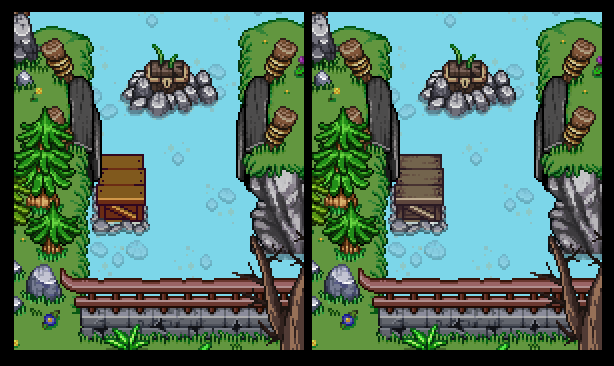 This week, the work on Puzzle World continues! 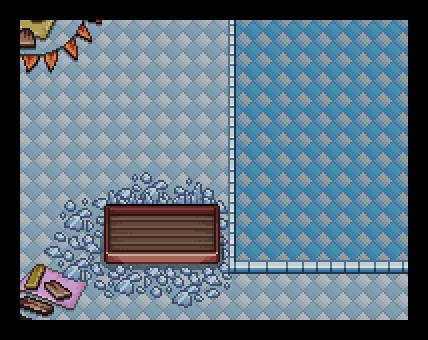 Next step is to transform the Statue Room into it’s sorry present state. 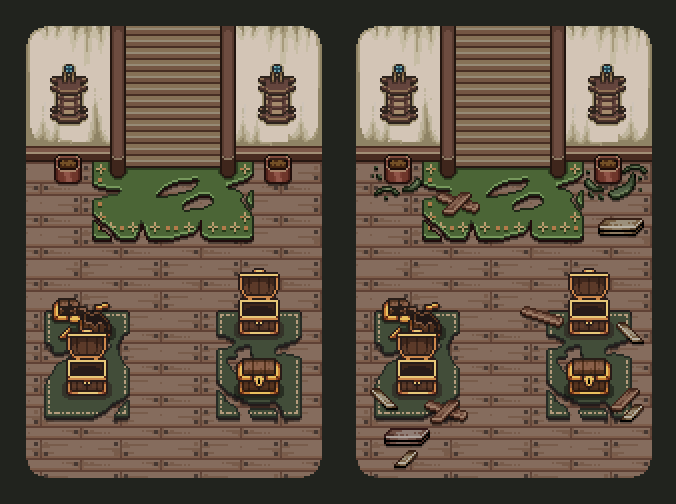 Since this will be the first room to be turned into a present version, it’s extra important to get everything right since a bunch of the props, such as the planks, will be reused in upcoming rooms. 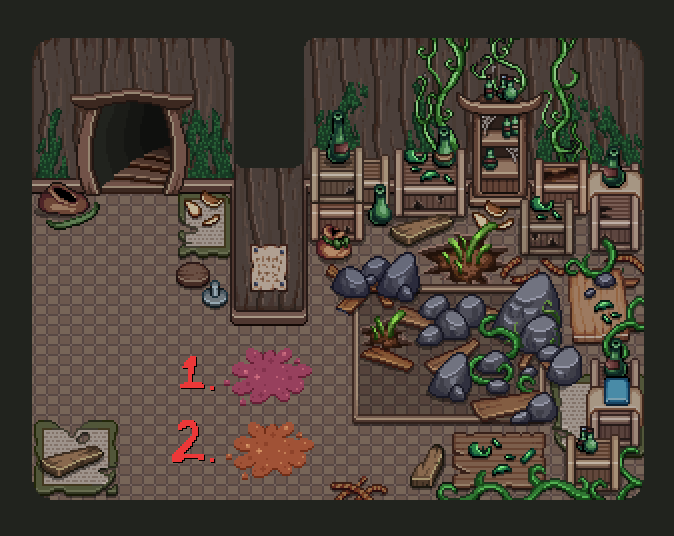 When creating this room, I had two options. 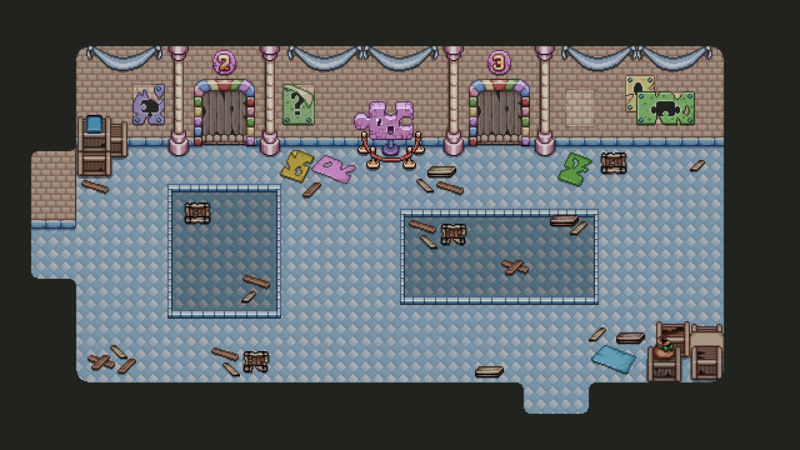 Either I use the already-made texture of the Flying Fortress walls & floor, or I make a new one. It’s likely people wouldn’t be able to tell the difference, since it was so long since you went through the Flying Fortress in the main story – but I still opted to make new graphics. I did this for two reasons: one, it gave me the opportunity to make the texture look even more like a wallpaper texture – instead of looking exactly like it does in Flying Fortress (which is built of what’s at least supposed to be real rocks), I could make a softer texture which would be easier to pass off as wallpaper. 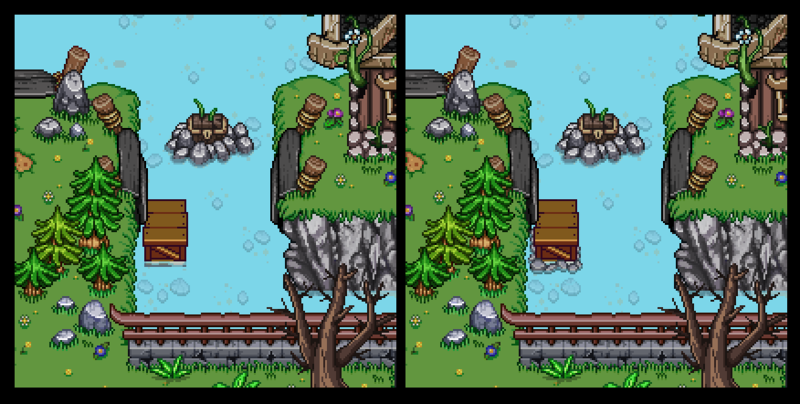 Second, the Flying Fortress graphics are very old at this point, and I worried that adding such an old texture among all the new stuff would look jarring – I’ve developed a lot as an artist since that time, so the difference in quality and style is quite big. 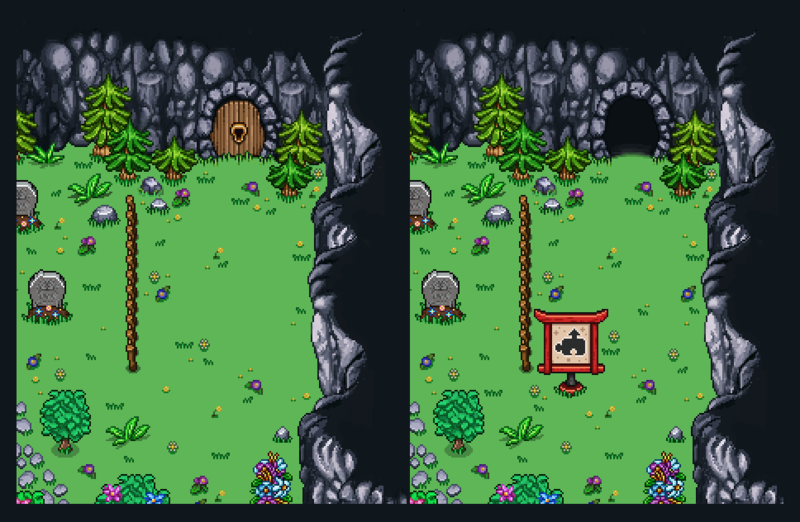 After finishing the past version, I added a pair of boxes that block the exit to the right. 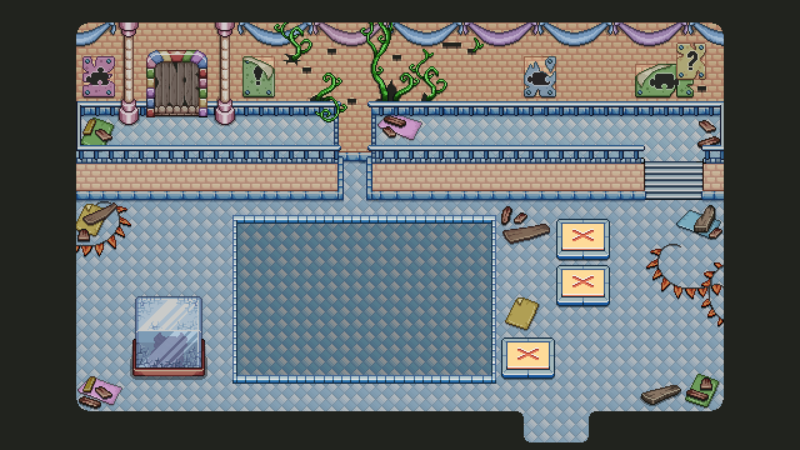 In this version however, the boxes are moved (since you enter the room in this timeline) and instead block your path to the top part of the room. To get there, you’ll need to complete the phase shift puzzle! Meanwhile, instead of cleaning up the bar, Montbel the owner (who isn’t present in the picture) has left all kinds of bottles and bowls on it for visual effect. ‘Aint he nice? Finally, let’s end the week with a portrait! I actually forgot I still had two more to make for the second Tai Ming zone. 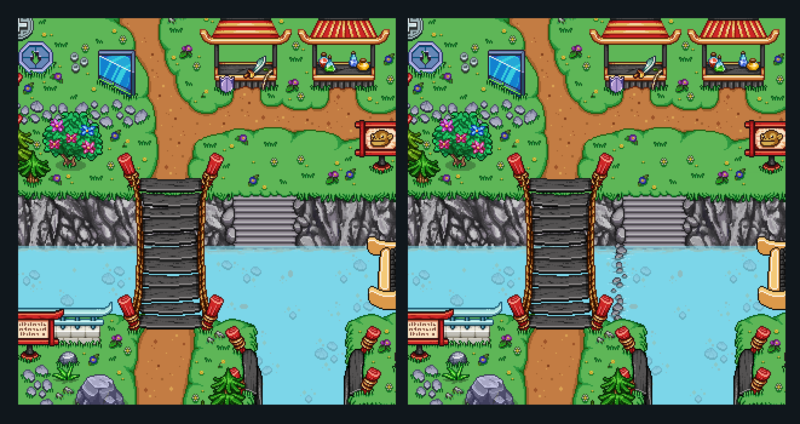 Guess I got a little bit too excited about starting to make backgrounds for Puzzle World! This guy is a hat salesman, having his shop set up outside the ancient Collector’s HQ. Like the hat salesman in Evergrind City, he has a kind of elegance to him! I guess it comes with the job, huh?